John Stanford was the superintendent of Seattle Public Schools from 1995 until his untimely death from leukemia in 1998. He was born in Darby, Pennsylvania on the outskirts of Philadelphia and graduated from Pennsylvania State University with a bachelor’s degree in political science. He joined the U.S. Army in 1961, and after 30 years of service he retired as a major general. Stanford then went to work as county manager in Fulton County, Georgia which includes the city of Atlanta. 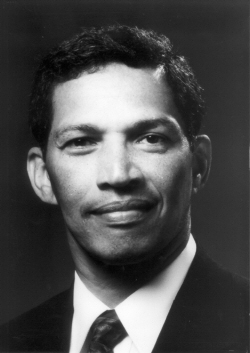 In July 1995, after being recruited by the Seattle School Board, he assumed the job of superintendent becoming the first non-educator to fill this position. Calling himself the children’s crusader he vowed to keep schools safe, to implement exit exams students must pass before promotion and to make principals the CEOs of their buildings. Stanford’s personal charisma brought positive attention to Seattle schools. He promoted a community-wide “reading offensive” that prompted the donation of thousands of books to school libraries. His plan to make principals the CEOs was embraced by a major business which made a donation to help train them in a new leadership institute. A former chairman of a grocery-store chain committed to spending millions of dollars to create a special program at T.T. Minor Elementary School. It was his feeling that a controlled choice program for racial balance did not serve minority students. At his urging, the school district abandoned race-based busing in 1996, replacing it with magnet schools and school choices within neighborhoods. His announcement in April 1998 that he had been diagnosed with leukemia brought concern and sadness to the Seattle community. After two rounds of chemotherapy and a stem-cell transplant, he died on November 28, 1998. Thousands attended his memorial and his leadership was memorialized with the establishment of the John Stanford International School, one of the programs he founded. “Tribute to John Stanford,” The Seattle Times, 2000: seattletimes.nwsource.com/special/stanford/index.html .